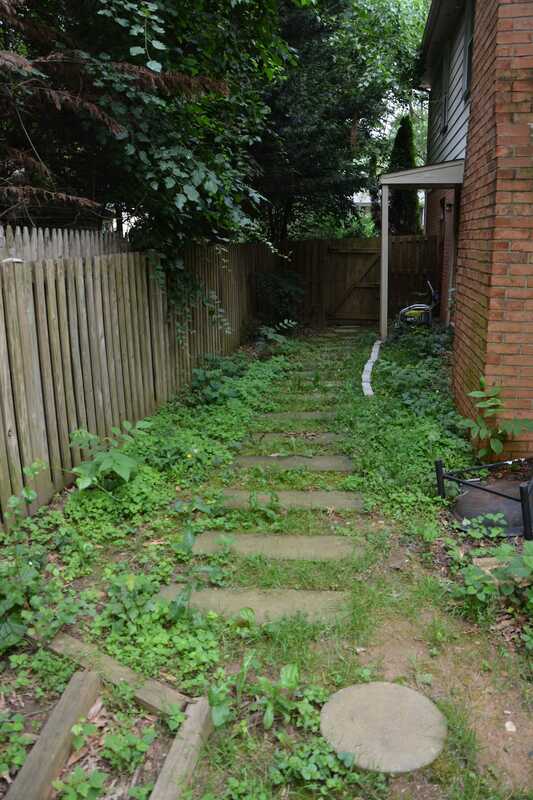 When we moved into our house in 2010, this side of the house had a stone walkway in place but it was overrun with weeds and it just didn’t lead anywhere, really. 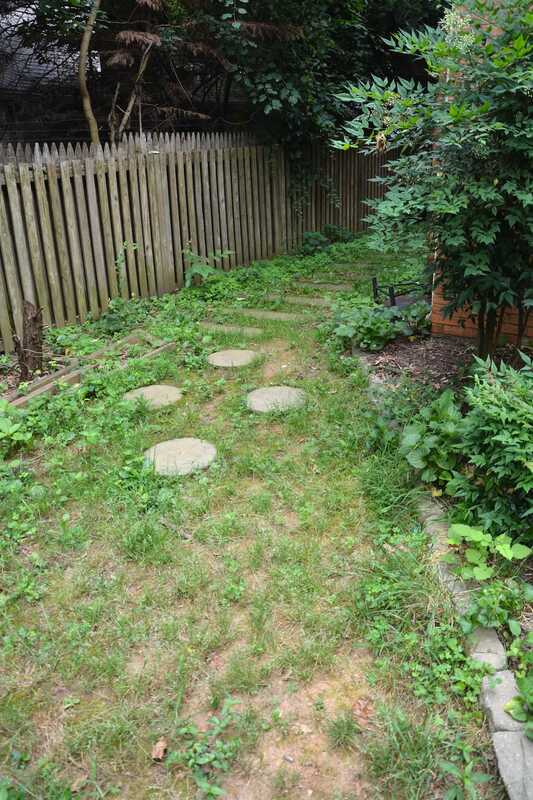 It opened into the backyard, but what we really needed was a stone walkway that leads to the patio. 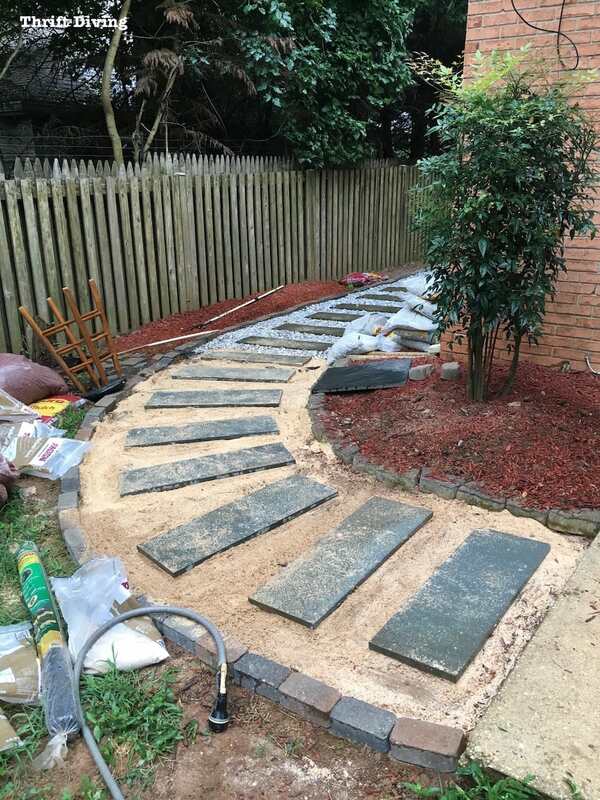 So here’s how I updated our stone walkway, which was a lot of heavy lifting, but well worth the effort! Because it looks beautiful now! 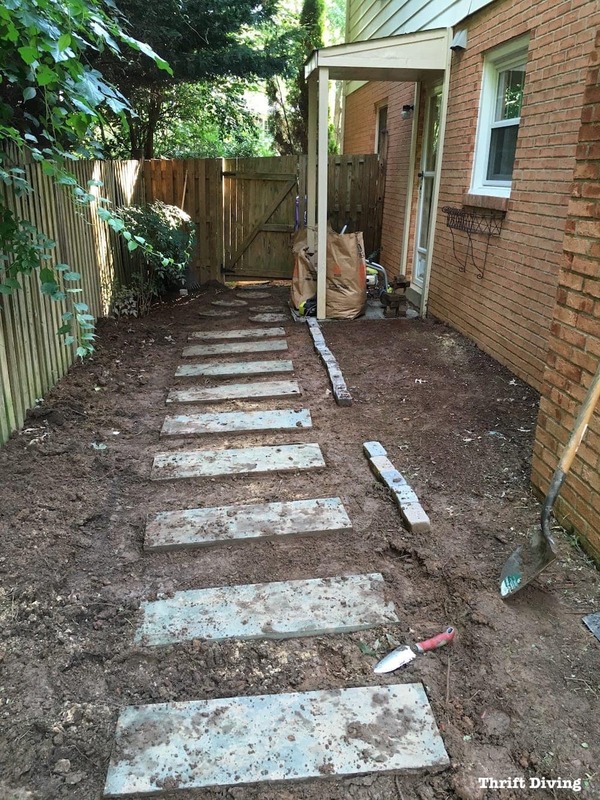 Here are the materials you’ll need to create a stone walkway. 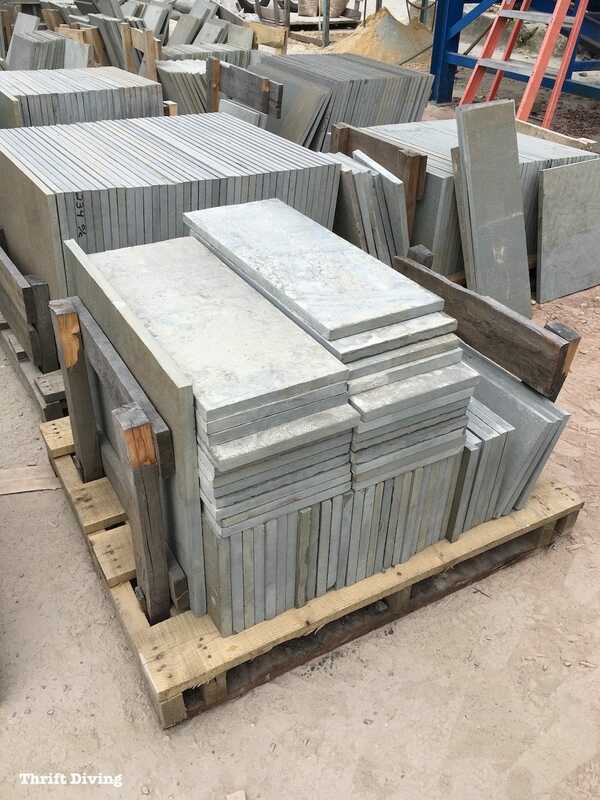 12″ x 24″ stones (you can use any shape of stone you’d like). Tamper for packing down your paver sand. Stone walkways can use any number of stones. 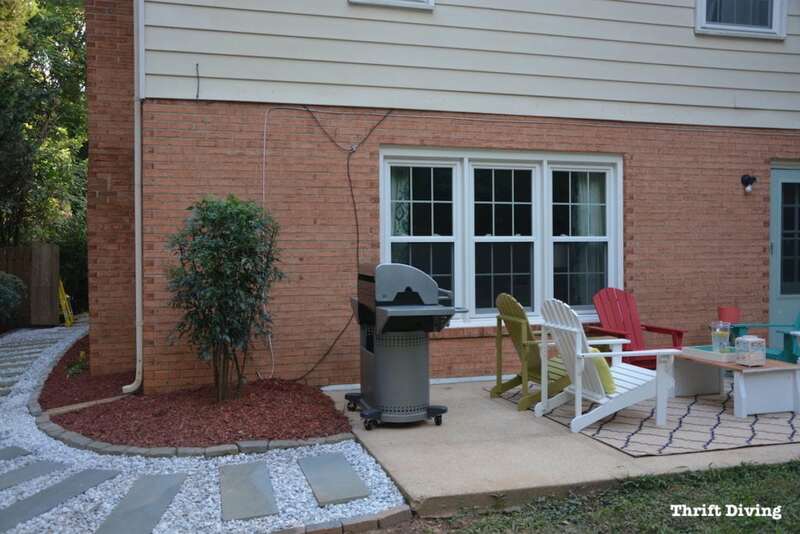 When we moved in, the previous homeowners already had these rectangular ones, so it made sense that when extending my walkway, I should use the same ones. Big box stores don’t carry speciality stones like that, so I had to find a local quarry to buy them. These stones, with taxes (6% here in Maryland) came to about $18 per stone. Total cost for 12 stones: $221. If you’re trying to keep costs down, stick with the stones at your local home improvement stores. I worked on the stone walkway on the side of the house first, but I had to figure out how to extend the existing walkway. You don’t have to lay stones and edgers the way I did. 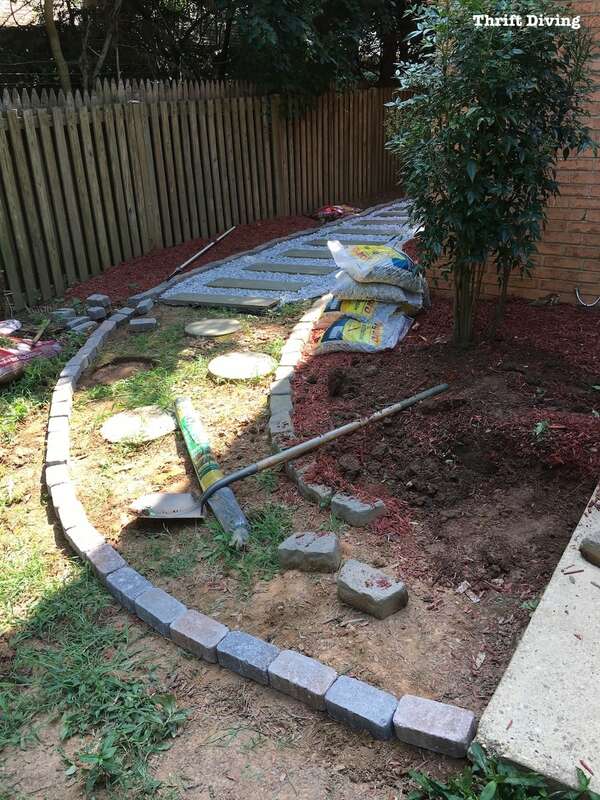 You can easily use a garden hose to draft out the shape of your stone walkway. Since I already had the edgers nearby, I decided to use those. This was the general shape I was going for. You’ll notice in the picture below that I used weed block around the previous stones, but I didn’t use any under the new stones I added. The reason why is because the previous stones already had a good, solid foundation. So I just laid the weed block around them. The new DIY stone path needed to have a solid foundation, which is why I used the paver sand there. I didn’t think the weed block was necessary but don’t do like I did. Add the weed block and then the paver sand. 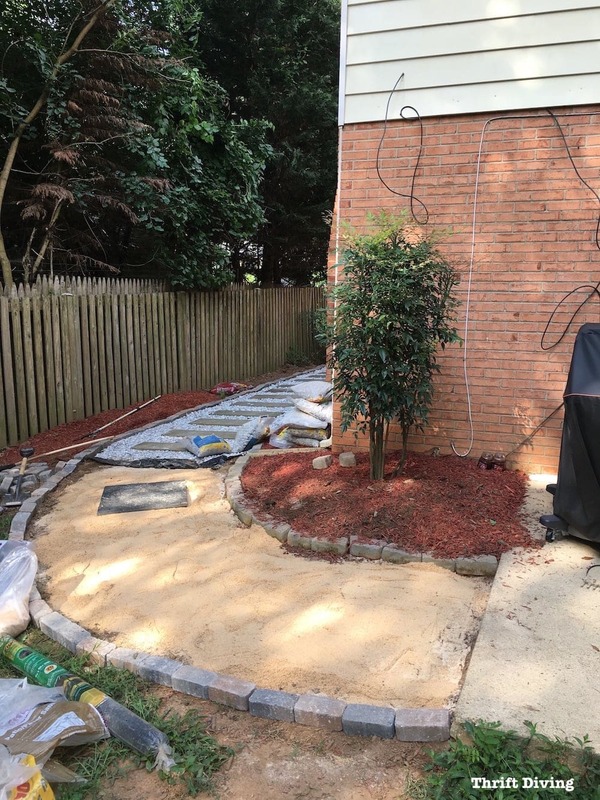 When placing the stones on the paver sand, you’ll want to shimmy them in against the paver sand and test each one of them to make sure they’ve got solid footing. If you notice any rocking back and forth, add more paver sand underneath and keep testing until, when you step on it, it’s completely solid and not rocking. Next, fill in your walkways with decorative rocks. I’ll admit that this was the hardest part because the bags were so heavy. Also, it makes sense to go to your local nursery and have decorative rocks delivered. Buying them by the bag is more expensive and costs more money. If I had realized I would need 20+ bags, I would have just had a truck delivered. Keep that in mind! STEP 6: Make Weed Maintenance Part of Your Weekly Tasks! Don’t get it twisted–even though you’ve got weed black as a barrier to weeds, that only covers the weeds under the rocks. It has nothing to do with the little floating weed seeds that end up sprouting on your DIY stone walkway! LOL. 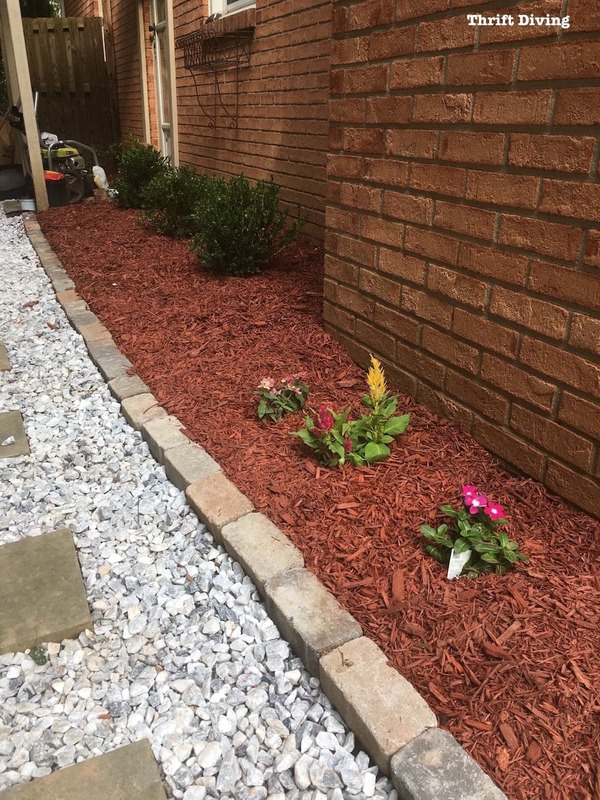 It’s a lot of work to maintain a stone walkway, but if you keep up with weekly or bi-weekly weed-killing or weed-pulling maintenance, your walkway can look nice for years to come. 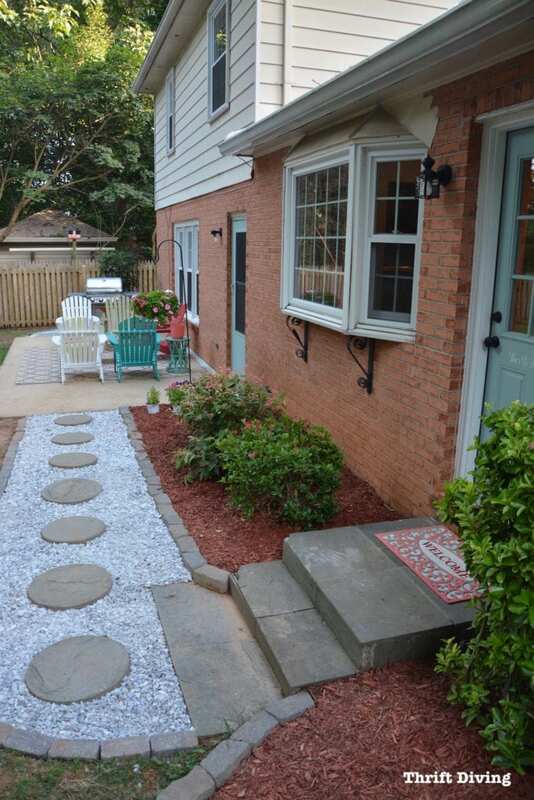 I’ve got more plants and flowers coming, and I need to replace this side door and tidy up the painting on the porch area, but with the walkway completed, and new boxwoods, and a few seasonal flowers, it looks so pretty now! And clean!! 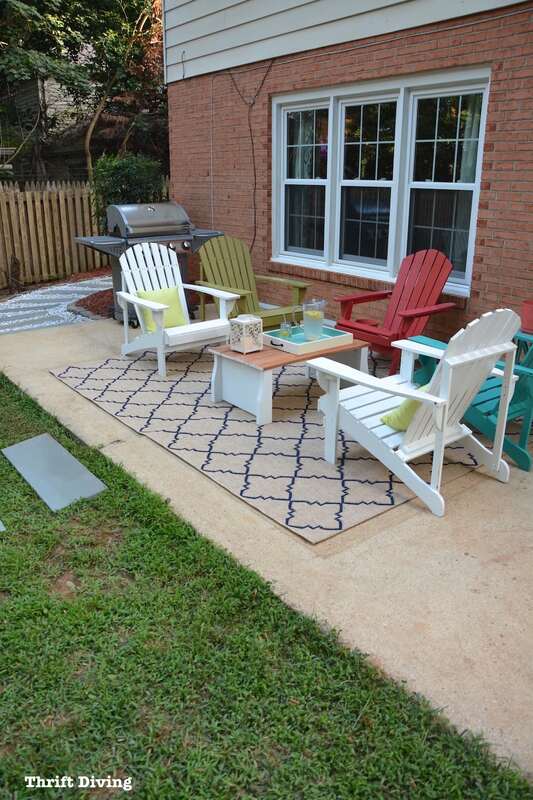 Now you can see how I wrapped the DIY stone walkway around to meet at the patio! 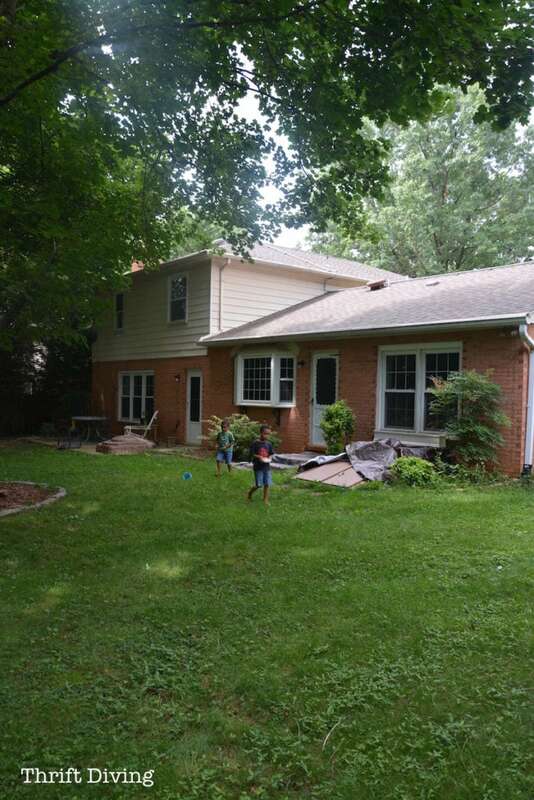 When my family and I walked out of the kitchen door, we hated stepping on the grass to get to the patio. 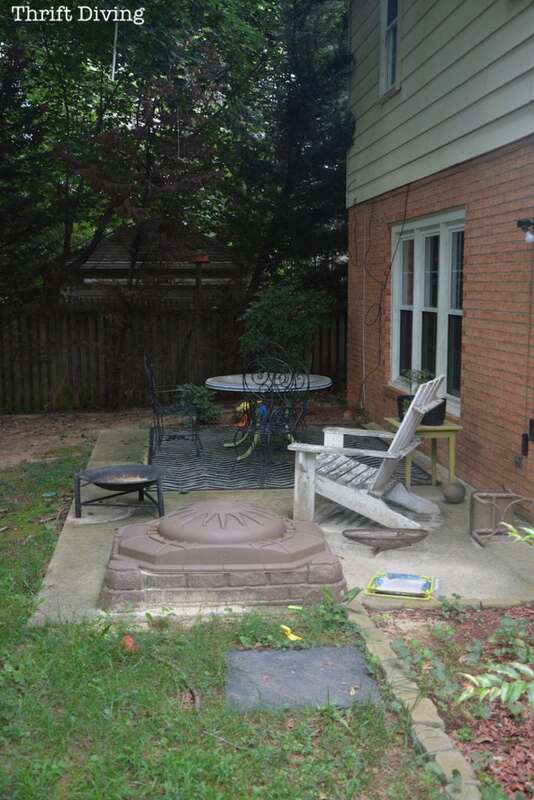 Not that we used the patio, but if we needed to go outside for any reason, it usually was a tip-toe-across-the-pavers type of creeping along. LOL. 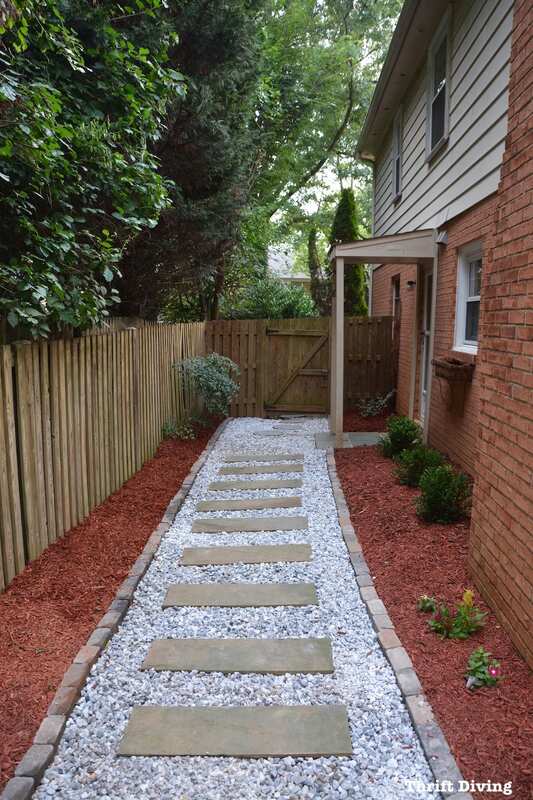 Now, with a new stone walkway I created leading from the kitchen door to the patio, there’s a cute little path to lead the way! These stones were already here from the previous tenants, in some other obscure part of the yard. I just borrowed these and placed them here. They fit perfectly! Looking at it from a distance, there really wasn’t anything inviting about this space at all. The chairs, while pretty, were skinny for big butts and were uncomfortable. I wanted those babies gone! One summer we had spent a week at The Outer Banks of North Carolina and I was really inspired by the Adirondack chairs. I had found 5 of them for $29 each at The Home Depot. 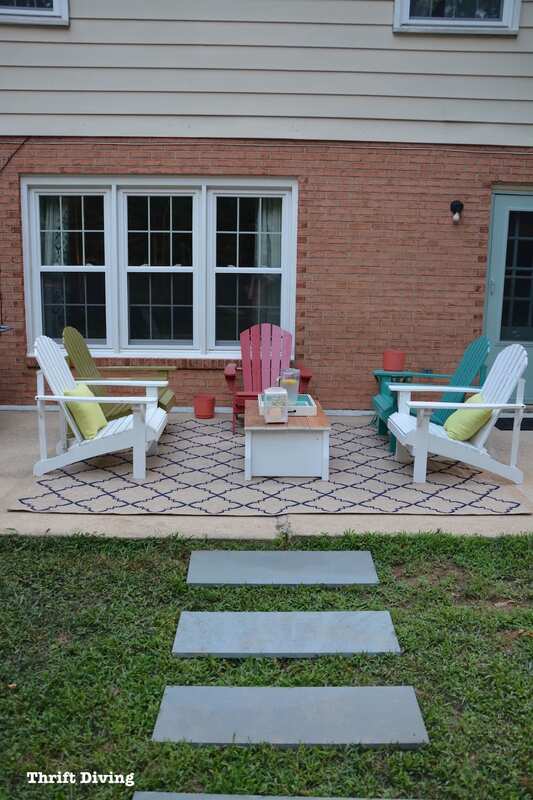 Now, with colorful Adirondack chairs, this space is ready for family, guests, and hanging out. 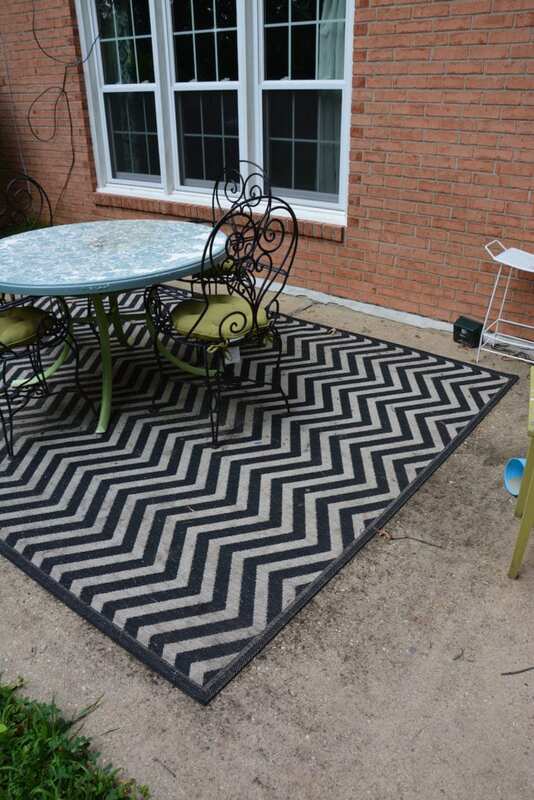 See how I later built a DIY fire pit for this space, too! A few extra stones I placed leading from the sandbox to the patio, as well. I wanted to get rid of the black and white chevron because that’s so played out. Plus, I can use it in my garage if I need to. I found this one at The Home Depot, thankfully! It was only $117, compared to many others that were twice that amount! 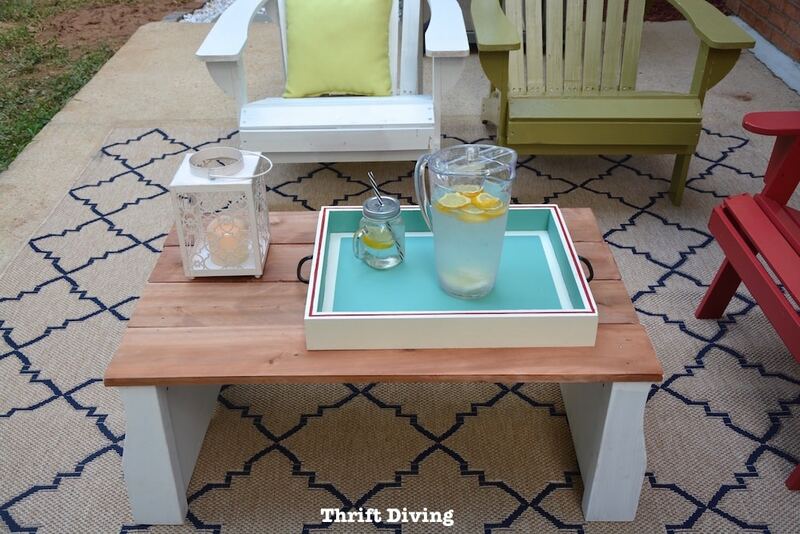 The Upcycled Crib Into a Coffee Table! While taking my chainsaw to my sons’ old crib that was in the yard, I was inspired. WAIT! I can use the bottom of the crib as a new patio table! As I was cutting, I was super inspired! 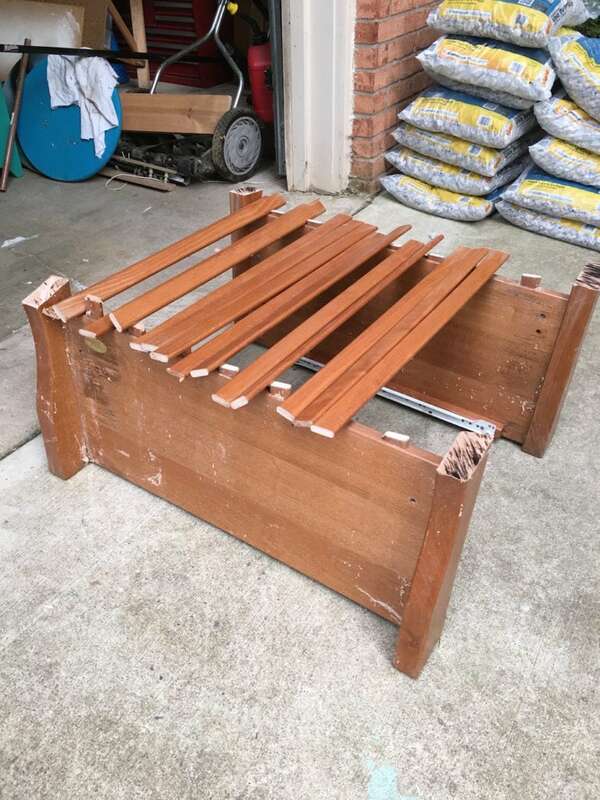 I knew it could work, but I wasn’t sure if I was going to use the slats for the top or not. I decided instead to add some weather-resistant cedar to the top, and–VOILA! 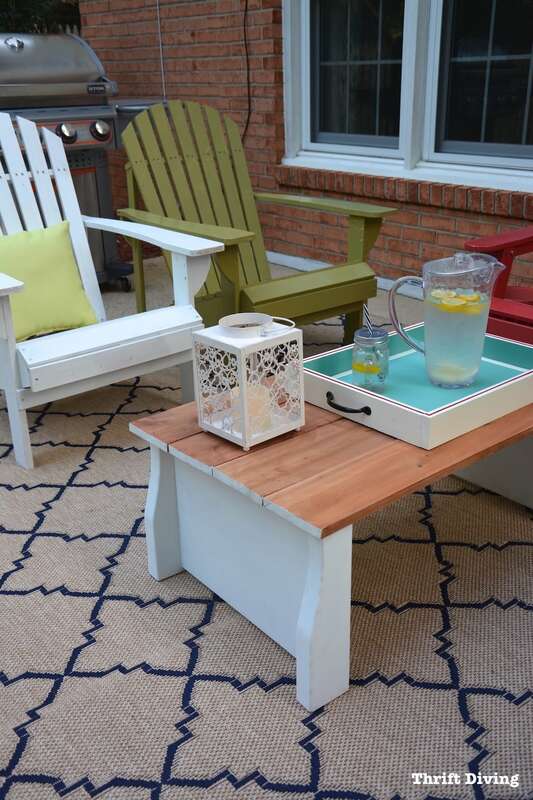 !–a new patio table! I’ll explain in another post about the chairs–putting them together and painting them. Much more cheerful and all five of us in my family have a place to fit! 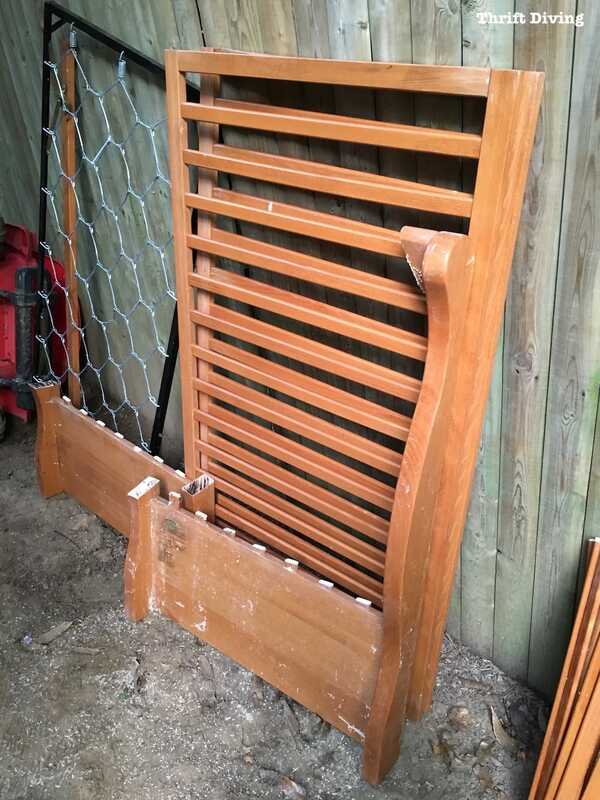 And last but not least, I had found this hammock at the ReStore for $44. 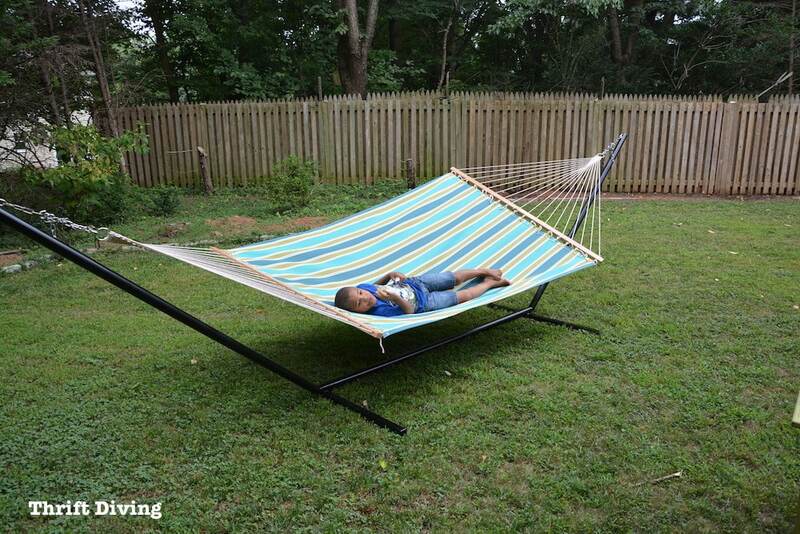 It came with a 15-foot hammock frame, too! But it was a bit dirty. 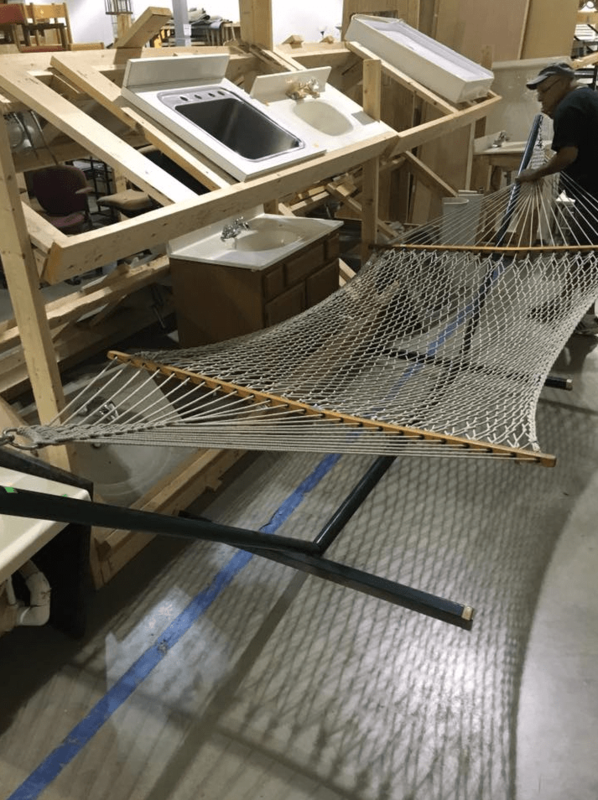 …but then I went to The Home Depot and saw this pretty hammock marked down to $35! Even with paying $44….then $35, that’s cheaper than anything I could have ordered on Amazon! I just spray painted the body a fresh coat of black, and then hung it up. Kojo loved it! 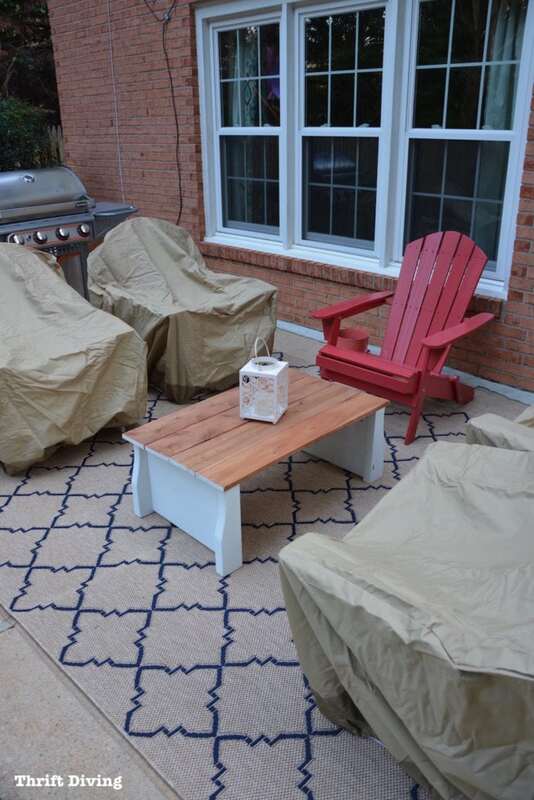 I bought Adirondack chair covers to keep the furniture covered when not in use or during the off-season. 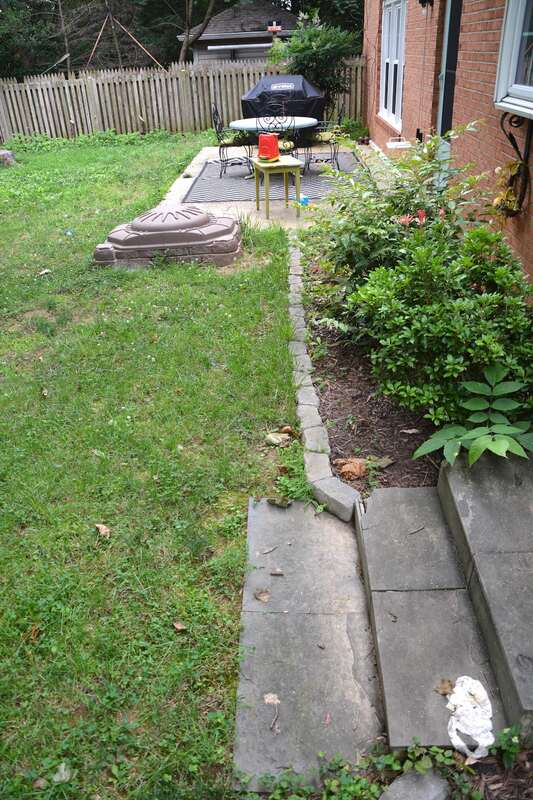 I happened to stumble on this picture of what our patio looked like during the first years of living here. 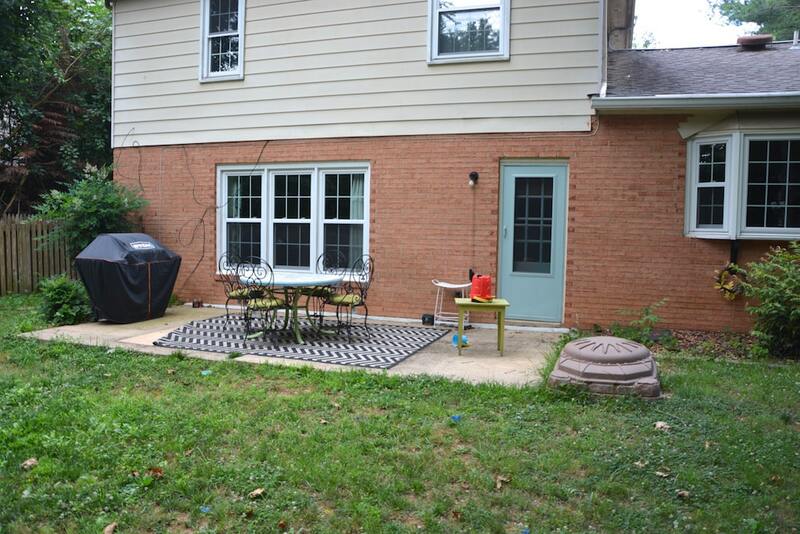 OMG…..we had that huge tree in our backyard that sucked all the light and made our patio grow green slime. It was just a horribly dark, unfriendly outdoor space. THIS is the kind of home I have always wanted! Something that feels pretty when I walk into the space, that makes me smile, inside and out. See how I replaced, painted, and stenciled the door, too. This has truly been a labor of love. And I’m so thankful for the makeover challenges we do here at Thrift Diving. Otherwise, I honestly don’t’ think I ever would have done it. I thought it was too difficult…too expensive (well….I was right on that one! LOL)….and too much for me and my skills. But I proved to myself that I can create any space I want, as long as I put my mind to it! I’ve got more to do in this yard, my friends. 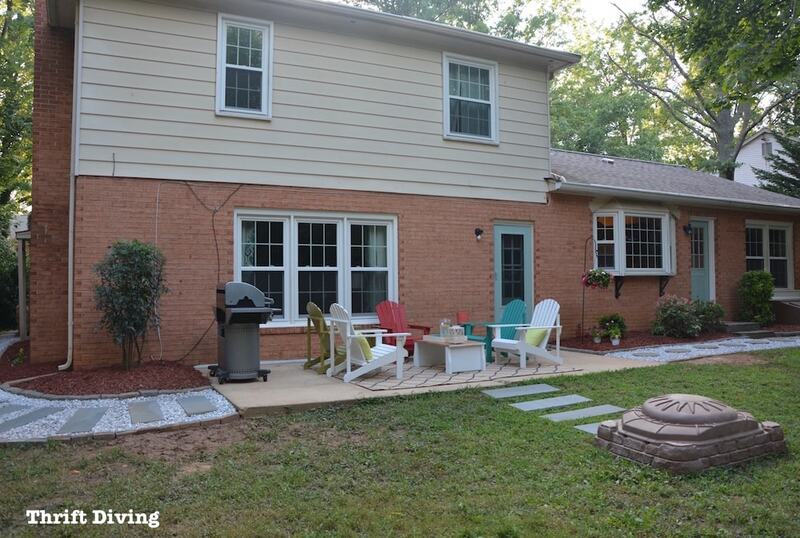 But for now, I love how fresh the patio looks, and that DIY stone walkway to the left and to the right of the patio really set the stage for a great hangout spot for my family! 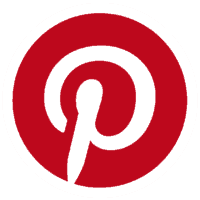 If you enjoyed this tutorial, click here to save it on Pinterest! Your talents amaze me. It looks comfy, colorful and calming – perfect for a family. Great job! I’ve missed something. What modeling shoot? Whatever it is, congrats! The yard looks a lot better now. All it needs next is a small veggie garden, everyone should know how to grow their own food. This looks so good!! It’s so neat and bright and pretty!! I know it was a LOT of work but it turned out so well!! This looks so awesome! The pathways look so good and I love the color scheme of the adirondack chairs. Great job on the entire space!